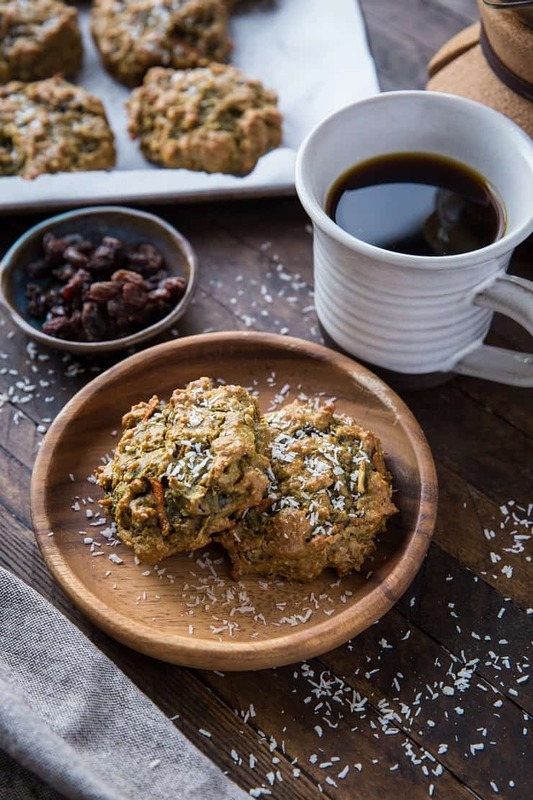 Healthy, delicious carrot cake cookies that are healthy enough for breakfast or packing up and taking for a snack on-the-go! 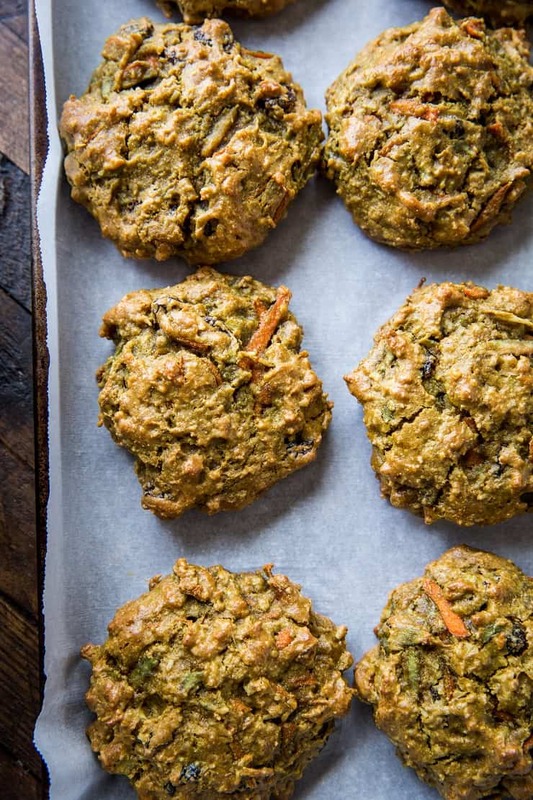 These clean and delicious grain-free cookies are great for sharing with family for brunch! Who here loves carrot cake?? Perhaps the better question is who here doesn’t love carrot cake? Truth: I’ve never met a carrot cake I didn’t like. I, for one, can get on board with carrot cake everything. A classic Paleo Carrot Cake is nearly impossible to beat in my book, Carrot Cake Fat Balls are one of my favorite snacks to put on repeat, Paleo Carrot Cake Pancakes and Paleo Carrot Cake Banana Bread are reserved for those special weekend breakfasts with friends or family, and Carrot Cake Overnight Oats makes for a delicious go-to meal prep breakfast. Because I’m a big fan of whisking off to the mountains for some sort of adventure, the majority of these cookies were eaten on a chair lift. I would put one or two in a zip lock bag, stick it in the pocket of my snowboard pants, then hit the slopes. It made for such a lovely mid-morning snack to keep me fueled for laps on the mountain. I made these cookies not super sweet on purpose in order to make them 1.) a lower-carb option than your standard cookie, and 2.) healthy enough to eat for breakfast or snack. 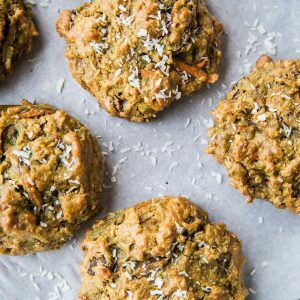 In this sense, I don’t really view these paleo carrot cake cookies as dessert, but you can absolutely use them as such! You guys, this recipe is so silly simple. 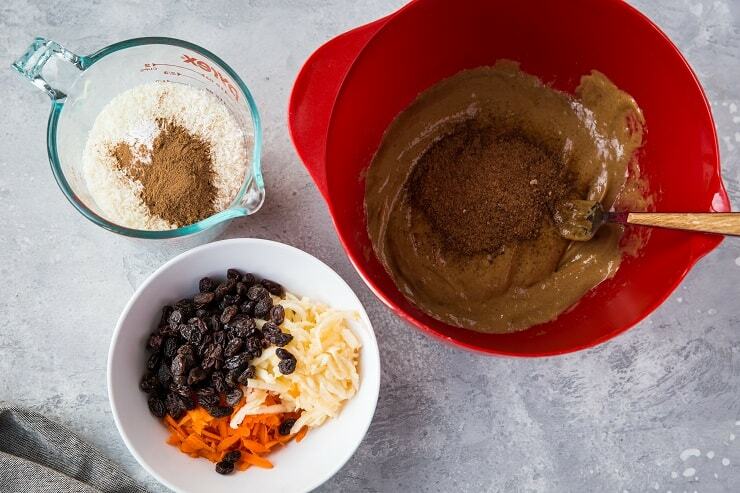 Whisk together the sticky wet ingredients in a bowl, then stir in the dry ingredients in a bowl. You can also just dump everything into a stand mixer and beat it until the dough is combined. Drop the dough on a baking sheet and bake! I make large cookies, but you can make them any size you prefer. Dip them in your morning coffee or tea and enjoy! Replace coconut sugar with pure maple syrup. Use your favorite nut butter. I prefer almond butter or sunflower seed butter. If you use sunflower seed butter, the cookies turn a delightful green – don’t be alarmed, this is normal! If you prefer a sweeter cookie, I highly recommend adding 2 more tablespoons of coconut sugar, or even toss in some erythritol, xylitol, stevia, or other zero-sugar sweetener. Replace the walnuts with pecans. Omit the flaked coconut and add another ½ cup of almond flour if you aren’t a fan of coconut. 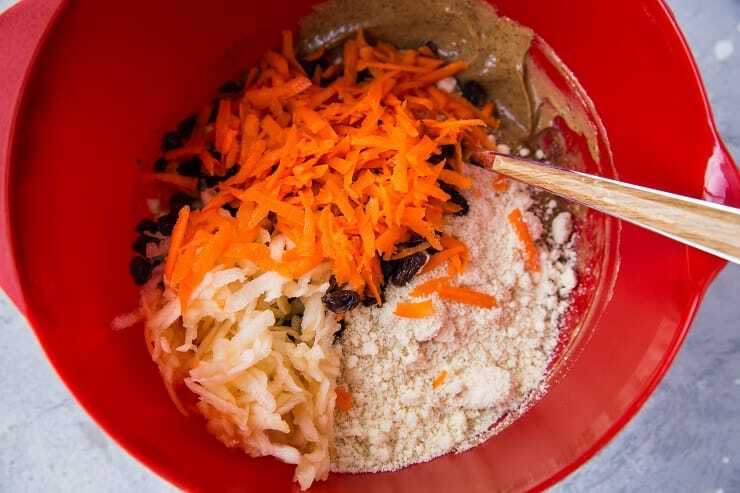 If you don’t have an apple on hand, double up on the shredded carrot! Make batches upon batches to keep on hand in case of company or emergency! Cookies for breakfast on repeat! 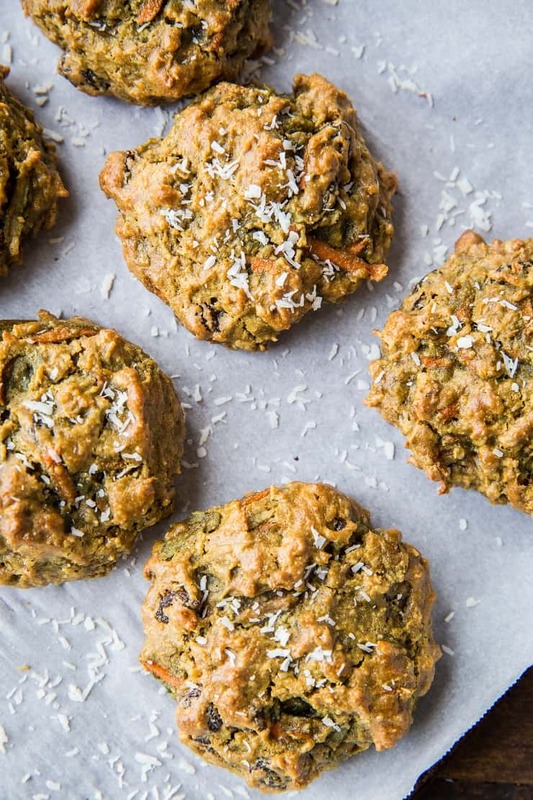 If you make these Paleo Carrot Cake Cookies please feel free to share a photo and tag @TheRoastedRoot on Instagram! 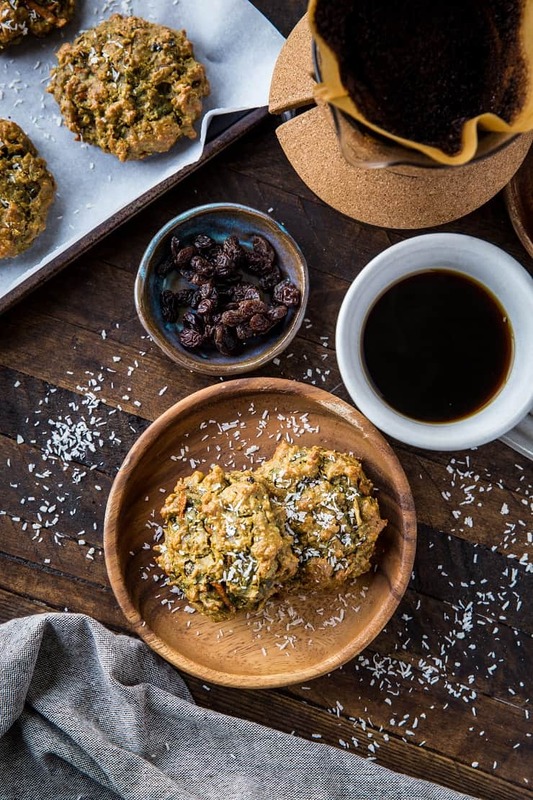 Grain-free paleo carrot cake cookies are a healthy breakfast cookie filled with all the essential carrot cake ingredients. Preheat the oven to 350 degrees F and line a large baking sheet with parchment paper. In a mixing bowl, whisk together the sunflower seed butter, eggs, and coconut sugar until creamy. In a separate mixing bowl, stir together the almond flour, shredded coconut, baking soda, ground cinnamon, and sea salt. Transfer the flour mixture to the mixing bowl with the wet mixture and stir well until combined. 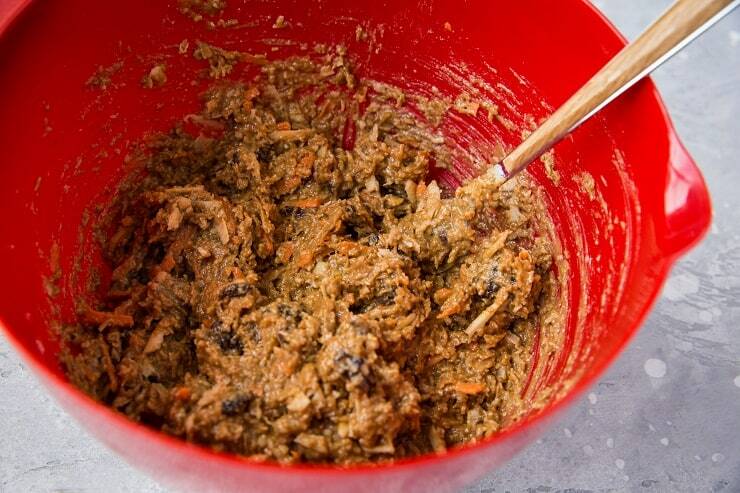 Stir in the remaining ingredients (apple, carrot, raisins, walnuts). Drop cookie dough onto the parchment-lined baking sheet (I like to make the cookies large, but you can make them any size you'd like). Bake 15 minutes, or until cookies are golden-brown around the edges. For crispier cookies, bake 17 to 20 minutes. Allow cookies to cool 10 minutes and serve. *You can also use almond butter, cashew butter, or any nut/seed butter of your liking. **Substitute eggs for 2 flax "eggs" to make vegan. I make your paleo carrot cake every year and a birthday gift to myself haha but these sound so good! Since you bring up eating them for breakfast, I’m wondering if you think it would work to sub a little collagen or protein powder in for some of the almond flour to add some extra protein?